The mouth of Loch Goil, showing Loch Long, from Portincaple. Loch Goil (Scottish Gaelic: Loch Goill) is a small sea loch in Scotland. It is an arm of Loch Long. The village of Lochgoilhead stands at its head. 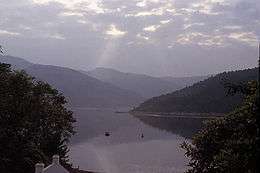 Located in the Loch Lomond & Trossachs National Park, Lochgoilhead sits at the head of Loch Goil, a fjord type sea loch. Only an hour from the Erskine Bridge, Glasgow Airport the M8 and Glasgow. The village is accessed from the Rest & Be Thankful pass by way of a 6 miles (10 km) single-track road. The area is surrounded by hills and mountains, with loch views, and a range of accommodation, leisure activities and entertainment. Carrick Castle lies on the west shore 4 miles (6.4 km) south of Lochgoilhead. The landscape at Loch Goil shows its remoteness and Highland grandeur with the Arrochar Alps surrounding with conifers in the Highlands of Scotland. It is used for exercises by Trident submarines from HMNB Clyde at Faslane.